Night of Champions saw Sting attempt to claim the WWE World Heavyweight Championship from Seth Rollins. Unfortunately during the encounter, Sting suffered a very concerning injury. Sting took a big bump to the announce table and at first, appeared to hit his head on a monitor. On replays and further viewing it appeared that Sting may have took the main impact from the announce table monitor on his arm and back which was heavily bruised for the rest of the contest. More problems came for Sting when he was power bombed into the corner and later collapsed when whipped to the ropes. However, with all these problems, Sting managed to finish the match and finish it respectfully and professionally. Seth Rollins retained the Championship by rolling up Sting whilst he was attempting to apply the Scorpion Death Lock. 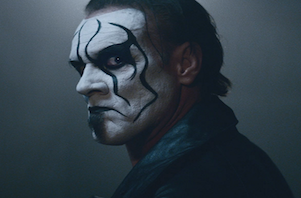 News was quiet on Sting’s condition until a couple of days ago where he provided an update on WWE.com with an interview updating everyone on his condition. Sting stated that he had tingling and numbness in his arms which then spread to his legs during the contest. When hearing Sting’s harrowing account I couldn’t help but instantly compare it to when Steve Austin sustained his neck injury at SummerSlam 1997. This occurred when Austin was given a spike piledriver from the late great Owen Hart. Austin was unable to feel anything from the neck down for a couple of minutes and was in a situation where he needed to finish the match. Austin managed to do this but it wasn’t a pretty sight. From what Sting said in his interview, he wasn’t paralysed like Austin but he was certainly in a very precarious position. One question we have to ask about this situation, was this smart booking from WWE? With all due respect to Sting, he is a 56 year old man. A man which is in fantastic shape and didn’t look to have missed a beat this past week. However, with that being said, I don’t think booking Sting to be put through announce tables is a smart move. Now we don’t know who made this decision, was it WWE? was it Sting? was it a decision made on the fly by the competitors? We might never know.